In January, 2016, I organized and taught a two-week seminar with Monica Montgomery called Museums Are Us. The seminar was one of the on-site courses offered as part of the Johns Hopkins University Museum Studies Program. We partnered with the DC Public Library to present a pop up museum on the themes of Home and Music. You can find a link to the post on our experience below. One of our students was Sean Blinn. He describes in this guest post how he took the concept of the pop up and adapted it to his small institution. The topic of the pop up–immigration stories–was relevant when it was held in mid-January 2017. But today, after the U.S. President’s executive orders severely limiting immigration and tainted with an anti-Muslim focus, this small, inexpensive yet powerful event is right on the mark. This is a wonderful example of how museums, even small ones with few resources, can create experiences that educate, encourage thought and dialogue, and counter locally the xenophobia that permeates our nation right now. Hats off to Sean and the Heritage Trail Association! Visitors talking at the Heritage Trail Association Pop Up Museum about immigration. Among the ongoing challenges we museum professionals face are how to reach new audiences and, having reached them, how to increase opportunities for active engagement and participation. We want our museums to be centers of community life and places for dialogue, but if you’re like me, you sometimes feel that we have more questions than answers, especially as we continually work to address ongoing issues of concern to our communities. One concept I have been working with in the last year or so is the pop up museum. To quote popupmuseum.org, a pop up museum “is a temporary exhibit created by the people who show up to participate.” They are often, but not always, done as a partnership between a museum and another community organization, often held at a location other than the museum. The organizers pick a theme, and people can bring an object of their own to display. The museum can help exhibitors write a label for their object, if desired. I first learned of the concept while a graduate student in the Johns Hopkins Museum Studies, when I worked on a pop up museum in partnership with the DC Public Library, under the direction of Gretchen Jennings and Monica Montgomery (who wrote about the project). I brought the concept back home with me, and convinced the Heritage Trail Organization of Bridgewater, NJ (where I recently became Chairman of Programming) to host one. The biggest challenge was mindshare: what is a pop up museum? Many people outside the museum field aren’t familiar with the term. I didn’t encounter opposition or even much skepticism about this program’s value, just questions about how it would fit with the group’s programming. After a couple of meetings, I convinced them to try a pop up museum about immigration as a pilot program immediately after a scheduled lecture about the history of immigration. Why immigration? 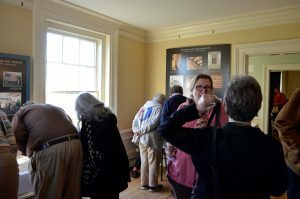 Although this part of New Jersey is rapidly diversifying, the boards, staffs, and audiences of the small museums and historic sites in the area aren’t diversifying as quickly as their communities. These interesting historic sites and the stories they have to tell are at risk of being lost forever once their current caretakers die off. More importantly for me personally, hosting an event with an immigration theme was a way to start to counter the extreme negative stereotypes that characterized the 2016 campaign. 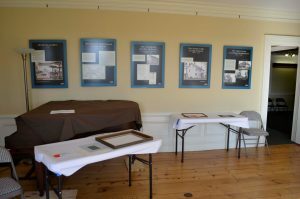 Unlike many pop up museums, the Heritage Trail pop up began with a lecture program, the type of which is fairly standard for this organization. The speaker explained the history of immigration to the United States and provided context needed to understand current issues. Attendees saw photos of caricatures of immigrants, some dating back almost 200 years. Everyone heard the same arguments that have been presented recently, but heard them as they were used against immigrants 100, 150, 200 years ago… against their own ancestors. Eyes were opened. People were ready to talk and more importantly, ready to listen. That’s where the pop up museum came in. Participants displayed objects showing their (or their family’s) immigration story. One person brought her own naturalization certificate. Another brought her grandparents’ Polish savings bonds. 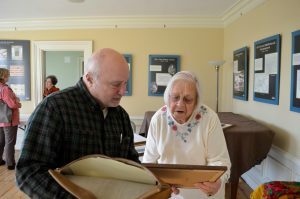 One brought photos of his grandparents at a local Italian-American social group meeting in the 1920s. One woman brought a handmade scarf from Slovakia, made by an ancestor about 100 years ago. We offered everyone a frame to put around their own object, showing that their objects and stories were every bit as important as a museum’s. Visitors are reunited after 60 years, as old acquaintances become new friends. Most of all, people shared their stories. People made new friends and, in one case, met former neighbors they hadn’t seen in 60 years. More importantly to the theme, participants realized that immigrants weren’t a group to be feared or demonized… they’re us. In addition to the object display, we set up a reflection space – large sheets of paper covering a folding table – so anyone who didn’t bring an object could still leave their thoughts. This was less popular with the Heritage Trail event than it was at the Johns Hopkins / DC Public Library event, but each pop up museum is different and we will probably use this idea again. 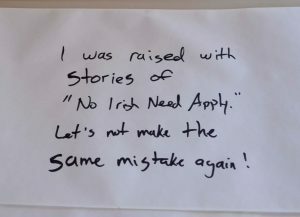 Visitors sharing stories of their past puts contemporary issues in a new light. We can be wise enough to learn from history. So why should you consider running one? It’s a participatory experience. Nina Simon writes about a hierarchy of social participation in museums and creating an environment in which museums are platforms for dialogue and sharing. A pop up museum can help your museum increase active participation and engagement. Creating connections to your community turns your museum into a more empathetic place. Following the Empathetic Museum Maturity Model, pop up museums can help tie your mission to the community. It gets the museum out into the community instead of waiting for the community to come to the museum. It’s easy and inexpensive to produce. All you need is a few folding tables and chairs, paper, and markers or pens. If you’re running one outdoors, a pop up tent or other cover might be helpful. The setup can be done in a couple of hours and for under $100. Setup is quick, easy, and inexpensive. Work with a partner, such as a library or other organization with its own community relationship. They have reach into audiences you didn’t know you were missing. Starting a new partnership has its challenges, but in the long run it can make for a better outcome for both parties. Hold the event outside a museum. This can reach people who don’t often visit museums, demystify the world of museums, and break down barriers between museums and their communities. This is where having a partner helps. Keep it connected to your mission and plan. If your long-range plan doesn’t include community engagement, ask yourself why not and work to change it. Recognize you will have to customize it for your audiences. Plural. As Sara Devine from the Brooklyn Museum says, there is no such thing as a “general audience.” Understand who your museum reaches and, perhaps more importantly, who you aren’t reaching but need to. Be patient. This is a new concept. If you can’t sell the idea right away, keep at it. Will a pop up museum replace everything your museum does? Probably not. But it’s an addition that lets us reach a wider, more diverse audience. Most of all, it’s lots of fun, and not just for participants. If you are reading this by email and wish to comment, please go to www.museumcommons.com. You can also tweet a comment to me @gretchenn or to Sean @The_Museum_Guy. You can contact Sean directly at seanblinn@gmail.com.